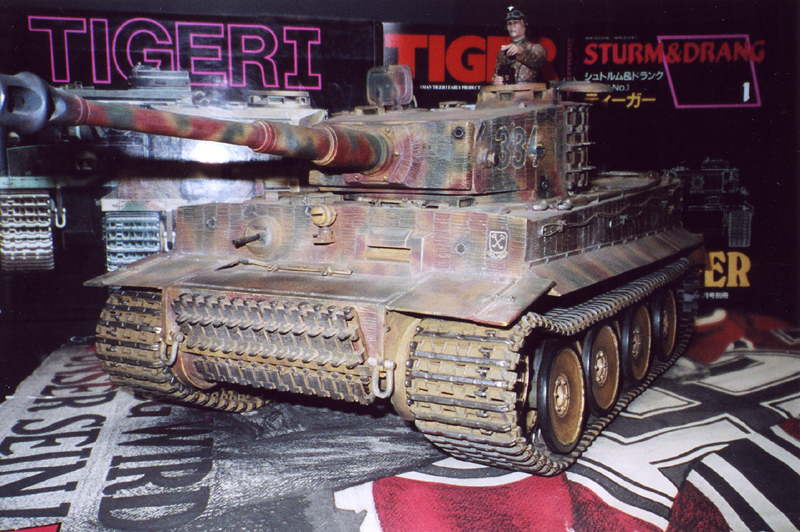 TIGER I AND TIGER II VARIANTS IN 1/15 AND 1/16 SCALE. During World War II, Germany managed to produce and came up with the best possible weapons in the shortest period of time. From the little armored machine gun tracked carrier Panzer I to the mighty Panzerkampfwagen VI the Tiger I and Tiger II; The Tiger was the most complete fighting vehicle of the war. The Tiger has to be perhaps the most famous and most popular tank in the world. (the whole world is Tiger I crazy!) Imagine in World War II just the sight of a Tiger tank guaranteed everybody out there to let ALL THE SINS OF ONE�S LIFE PASS RIGHT IN FRONT OF ONE�S EYES!!!. In the true annals of military history, no other armored fighting vehicle covers itself with glory more than a TIGER!. The Tiger was technically the most sophisticated and best engineered vehicle of its time, and remains one of the world's most legendary weapon systems. The popular myth of Germany's great wealth of first-class equipment is a legacy. The German Tiger tank will always be welcomed by the many thousands for whom it is a perenially fascinating subject. As one might expect, the German Tiger tank was normally first-class, carefully made and beautifully finished. As it took far longer to build a German Tiger tank using highly skilled workers. Whereas the Sherman and the T-34 were far more suited to mass production by relatively unskilled workers. But it was the superior tactical handling of the fast-thinking, well armed German tiger tank that sliced through allied armor with laughable ease. In battle, the fearsome Tiger tank gave the allies a great shock, as a Tiger tank could take on a squadron of Shermans and T-34's single-handed. The Tiger tank wreaked havoc among the allied tank forces and tore the guts out of the Shermans and T-34's. The Germans knew that they were operating the best and most potent tanks in the world, but it was the allies themselves that established the Tiger's legendary reputation. For the allies; the Tiger tank apparently exerted an almost mystical fascination. The allies feared the German Tiger tank. The allies would simply run in a cowardly rout if a Tiger tank would appear on the battlefield. Such drastic actions were certainly the case by in-the-field experience and with the introduction written in the allies blood. The Tiger tank did great physical and moral damage to the enemy, and restored and fortified German tank morale. This caused the Tiger crew's morale to zoom and depressed that of the allies. In truth, the main weapon was fear. Waging war is about more than bullets,bombs or bayonets, waging war is also about prevailing in mental conflict, about making the other guy think the fight is lost, preferably before it has begun. One need not destroy one's enemy, one need only destroy his willingness to engage.